Thomas's Two-striped Grasshoppers (Melanoplus thomasi) are colorful grasshoppers found in Arizona, New Mexico, Texas, and Mexico. 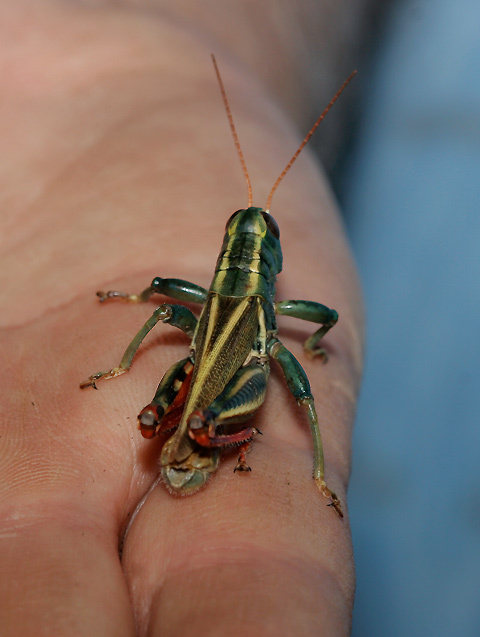 These grasshoppers are typically found in lush riparian areas with abundant herbaceous plants to feed on, and they can sometimes occur in surprisingly large numbers. While walking along a dry wash in southern Arizona's Empire Ranch, my dad and I encountered hundreds of Thomas's Two-striped Grasshoppers. With our every step, we sent several of these and other grasshoppers hopping away. It was mid-November and thus very near the end of grasshopper season, so it was surprising to see so many grasshoppers still around. My dad managed to capture an especially colorful one so that I could photograph it. 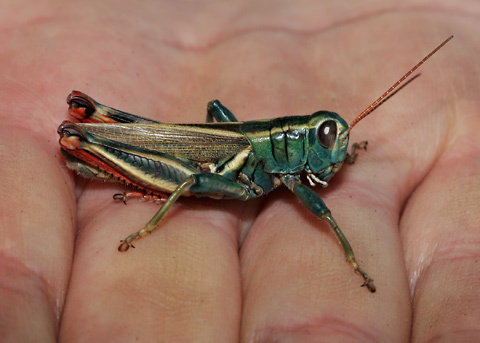 An adult Thomas's Two-striped Grasshopper is usually mostly blue-green in color and has orange antennae, large, dark eyes, two pale yellow dorsal stripes that converge near the hind legs, and red tibiae on its also two-striped hind legs.